Adam Franklin is the co-author of Web Marketing That Works. His popular presentation will teach you an email marketing formula that you can take back to work and start using immediately. Based on Adam’s results of getting double the industry open-rate on email campaigns, you’ll learn how to send entertaining email marketing campaigns that people love to open. 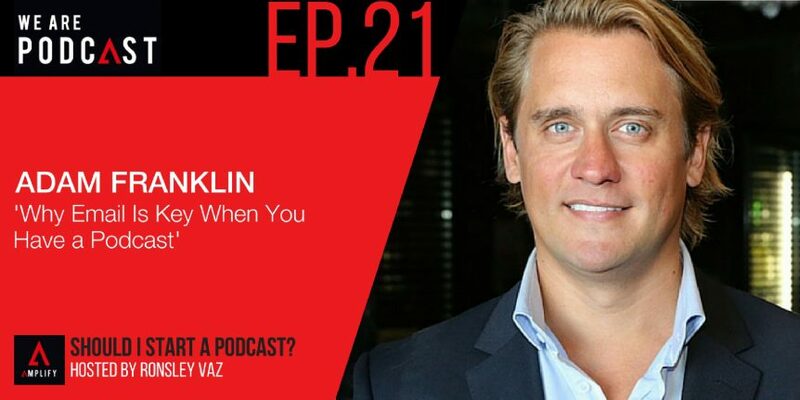 Plus, he hosts a top rating iTunes podcast, is an international social media speaker and marketing manager of Bluewire Media – the web marketing firm he co-founded in 2005. Adam’s Bluewire Media blog has been named as one of Australia’s Best Business Blogs for four years. He is a regular blogger for Startup Smart and occasionally writes for Smart Company and the Sydney Morning Herald. He has been a guest on the radio show 2UE as well as many popular podcasts. Adam co-created the free Web Strategy Planning Template which has been seen by hundreds of thousands of marketers worldwide, and his weekly “Bluewire News” email goes out to over 10,000 readers. Adam has featured on Smart Company’s Hot 30 Under 30 and the Dynamic Business 2010 Young Guns list of young entrepreneurs. What would've made it easier/what would you have changed? How often should I podcast? How complicated is it to do a podcast to drive email list growth? “Well, you’ve got to ask people to be in the show. If you are doing an interview show, you’ve got to ask people on which means that you could get rejected. So, a fear of rejection kicks in. You’ve got to think what to say, which can be a little bit scary too because what if we say something and stick it up on iTunes forever and people think we’re stupid or whatever else? There’s a little bit of fear putting yourself out there publicly because you can get criticised. What are the common mistakes that podcasters often make? “I kind of feel that the main challenge of a podcast is that once you start you should continue the obligation and the responsibility to the people that take the time and give you their attention for 20, 30 or 40 minutes for each episode. Which podcast should I follow, why and how often? “The ones that I particularly like at the moment are Sean D'Souza's podcast. It’s called The Three Month Vacation. It’s a business podcast and the whole idea is how to run a business that you enjoy as well as having time to take a three month vacation per year. He’s a fantastic marketer. He’s an Indian guy who lives in New Zealand. I love his podcast. “The Tim Ferris is usually very good. “The other one that I like is Jayson Gaignard, Mastermind Talks. He’s had some really interesting ones and I’m trying to get more on being a member of the Mastermind group. “The Webinar Ninja Podcast, I found very valuable.